Opening with Hunter S. Thompson’s written reactions to seeing 9/11 unfold on TV, Alex Gibney’s Gonzo thrusts us into the idea of Hunter first as a journalist, a rebel, a successful writer, a political campaigner and finally a man, the product of all his excesses, who was loved and admired by many. In-between detailing the author’s rebellion, out of control gun enthusiasm and drug use, we focus on only three major writings of his - his breakthrough novel; ‘Hell’s Angels‘, his most popular work, ‘Fear & Loathing in Las Vegas’ and arguably his best work; ‘Fear & Loathing on the Campaign Trail ‘72‘. Gibney gives us a cross section of interviewees, hearing mainly from his former wives and son, Juan Thompson, various ex-politicians including George McGovern and Jimmy Carter plus his Rolling Stone editor and contacts during his prolific 1970’s period. Friends and peers are present too of course; Ralph Steadman, Tom Wolfe, Jimmy Buffet, but most notably Gibney avoids the trap of having an onslaught of celebrities reminisce about Hunter which helps to give the audience a more serious view of his importance to journalism and American politics, at the same time successfully evading or rehashing comments or ideas from Tom Thurman‘s 2006 slimmer documentary, Buy the Ticket, Take the Ride. Put together with a both a professional, yet at times clunky pace, Gonzo combines large amounts of archival footage and photos with narration by Johnny Depp, who reads from - and is sometimes shown reading, relevant passages from Hunter’s writings. The biggest coup, however, is hearing various excerpt from Hunter’s own tape recorder - showcasing unique “in the moment” time capsules with the writer whilst on his wild escapades of gonzo journalism. Ironically, the film’s most awkward moment is when focusing on his most popular novel, ‘Fear & Loathing in Las Vegas‘. The director spends far too much time showing clips from Terry Gilliam’s film adaptation and not enough exploration via the interesting Depp reading device or Hunter’s at the time comments - the segment certainly stamps the novels importance, but the overuse of movie footage crucially breaks up the tone. It’s a rare moment of ill judgement on Gibney’s part, but the following sections on his political campaigning alongside George McGovern and his influence as a journalist on American politics during the late 60’s, early 70’s retain the best moments of the documentary. These plus an earlier part which shows in detail Hunter’s attempts to run for Sheriff of Aspen, Colorado. These are poignant moments and one where ex-wife, Sandi Hunter recalls the latter being Hunter’s greatest moment, “having the passion to move people”. Not to be over-awed, the director exposes the clear buffoonery of the man also, countering the praise with obvious moments of ill judgement and unreliability by Hunter throughout his life, which lead to, amongst other things, his inability to re-create interesting work in his older age. As the film moves onto Hunter’s suicide, the atmosphere shifts and even though his son admits “that it was no secret“ his father had planned to kill himself for many years, there’s a difference between that and it actually happening. Above all, the emotion is still clear on some of the interviewees recorded not three years after the event. Appropriately, we are shown the construction of the 'gonzo fist' tower Hunter had organised for his funeral and we’re left with the feelings of if only he’d waited, or perhaps not killed the man over the myth. A man that Tom Wolfe describes as probably being “trapped in gonzo”. 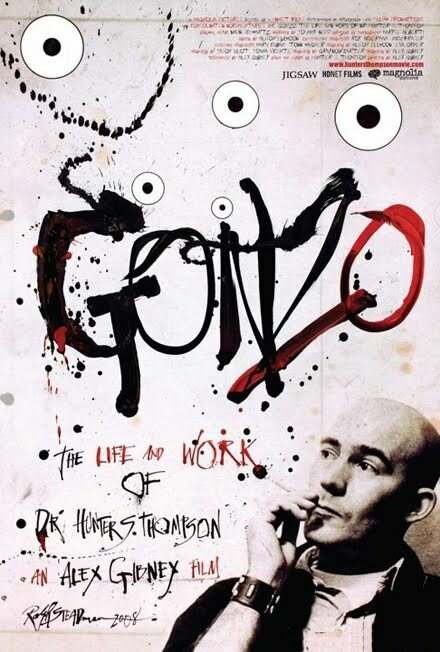 Though not definitive, and possibly falling into the trap of clichéd eulogizing a times, Gonzo is still recommended for fans of Hunter, anyone with an interest in American politics or who just want to see what effect a flawed visionary can have on people and culture.